So I had to do something that all military wives hate to do...Say Goodbye. It could be that he's only leaving for a week or a tour of 18 months, saying goodbye never comes easy! So on Thursday, I had to say goodbye and put myself in the mind set that its only for 6 weeks and its what's best for the two of us and our future family. So with that said, I've had little time to craft. AND I had a cake due this weekend, which left me with even less time. So the following is the cake that was constructed. It is for my bestfriend, Steph's, brother. He plays on Rider University's hockey team and they're having a banquet for family friends to celebrate the end of the season. Her mom said she was thinking of just getting an image trasnfered onto a sheet cake but clearly thats not how i like to create cakes so this is what I came up with. What do you think?? 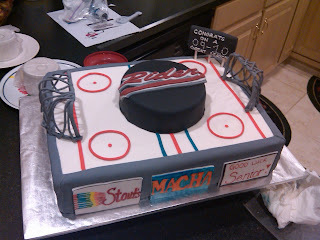 All the "billboards" on the front of the cake each represent something from this season. I really hope they all like it. This card was pretty simple but still nice. Patterned paper was from Martha Stewart, stamped bird and sentiment are both from Inkadinkado, boarder punch was used as well as the cuttlebug "swirl" embossing folder. Any questions let me know and I hope that you like both the cake and the card! k & company embellishment kit! Finally! !